The Warlords should appeal to those who loved John Woo’s Red Cliff, although it’s not quite up to Woo’s standards. In Warlords, director Peter Ho-Sun Chan orchestrates an epic story about the Taiping Rebellion, which began in 1850 and spread across 14 years of bloody Chinese history. Warlords features a strong performance by Jet Li as General Pang Qingyun. 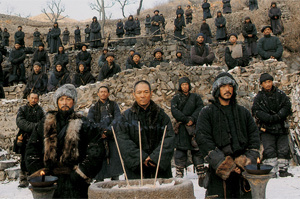 General Pang, the sole survivor of a horrific opening-film battle, winds up leading a band of former bandits into a war he hopes will end oppression of the downtrodden masses. Pang’s a pro-freedom guy, which means that he wants to free ordinary people from the ravages of war. Along the way, General Pang makes a variety of challenging battle-related decisions, not the least of which involves the slaughter 4,000 rival soldiers who already have surrendered. With starvation a constant threat, Pang believes that he can’t deplete the food supply for his own troops by feeding prisoners. The relationship between General Pang and two men (Takeshi Kaneshiro and Andy Lau) provide the movie with a narrative backbone. The three warriors swear a blood oath that unites them forever. This pact immediately tips us that the story will examine the role of loyalty and betrayal in a society ruled by treacherous rival factions. A love triangle introduces a character played by Xu Jinglei, who lights some sparks with Li in the early going but who’s only intermittently involved in the rest of the movie. No problem. Love is a bit beside the point in a movie such as Warlords, which keeps busy by putting the ideals of its warriors to the test. Li’s martial arts prowess turns up only toward the end. That also makes sense: The story is about massive battles, not individual combat. Battlefield spectacles and bracingly composed shots add to the interest, and when Warlords finally turns tragic, it mines emotional pay dirt.